When it comes to back-to-school time, kids are always the focus - which makes sense, right? After all, they're the ones that have to get up, get dressed, get out the door with their lunch and their backpack, make it through the day, go to after school activities, do their homework, get some sleep, and do it all the next day. As any parent can tell you, that's true... to an extent. Because although kids are the ones hopping on the school bus or sitting at the desks, it is the moms and dads that are the ones who tirelessly work behind the scenes to make sure it all happens. 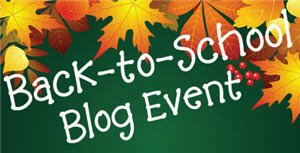 Who is acting as the alarm clock, packing the lunches and driving to the activities? Fortunately, there are companies and places out there that realize that hard working parents are superheroes this time of year and often need a break from the hustle and bustle. Which is why the Kids Eat Free promotion going on at IHOP is a great way to take a night off of cooking and have a delicious meal for the whole family! 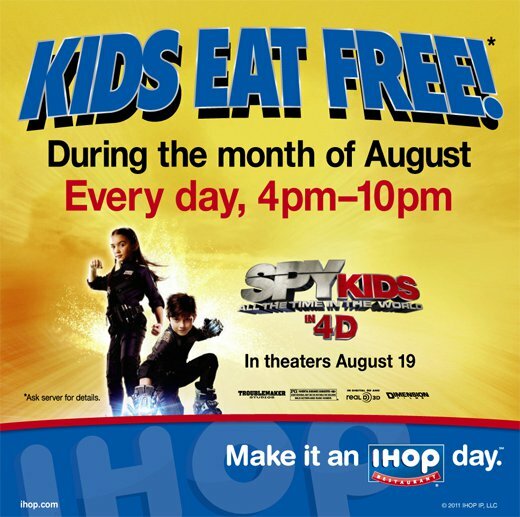 Running through August 31st, every day from 4 p.m. to 10 p.m. children 12 and under can order any item off the "Just for Kids" menu for free with every purchase of an adult entrée. Every item on the IHOP kids menu – from the signature Rooty Jr to the crispy chicken strips to the Create-A-Face Pancake – are SIMPLE & FIT selections that are under 600 calories, and lunch and dinner items are served with fresh fruit. So not only is your child's meal free, but it is delicious and healthy as well! 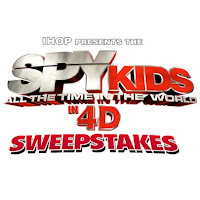 And, adding to the fun, children will receive an exclusive "Spy Kids" themed activity book packed with adventures for the whole family, as well as a special section filled with valuable back-to-school coupons, including special offers from retailers of name-brand shoes and clothing. When it comes to getting kids prepared for the start of the school year, I appreciate that IHOP, one of America’s favorite restaurants for breakfast, lunch and dinner, is doing something to give parents a break with the return of its popular Kids Eat Free promotion. Throw in the "Spy Kids" activity book with money-saving coupons for back-to-school purchases and it's a win-win! But, wait! 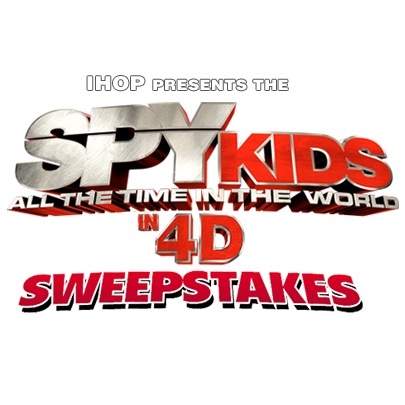 For even more winning, families also have a chance to win their own action-packed adventure with the launch of the IHOP "Spy Kids" Sweepstakes. Running from August 1st - September 31st, enter for a chance to win one grand prize family trip for four to Troublemaker Studio in Austin, Texas for a meet and greet with Spy Kids writer and director, Robert Rodriguez. The grand prize winner also receives passes to nearby family attractions, including Schliterbahn Water Park and the Austin Children’s Museum, plus a DVD prize pack and IHOP gift cards. Four first place winners will receive a movie studio swag bag filled with DVDs and other promotional items, as well as IHOP gift cards. To enter for a chance to win and for official rules visit their sweepstakes page. One lucky person will win a $25 gift card to IHOP! Be sure to visit the IHOP giveaways on An Island Life, A Frugal Friend and Planes, Trains and Taxi Cabs as well for even more chances to win a great gift card! To enter to win: Tell me what makes you a superhero during this time of year. 1 Extra Entry if you Like IHOP on Facebook. A big thank you to IHOP for providing a $25 gift card for one lucky giveaway winner. The opinions shared are my own and honest and if you really need to see more, click here to see how I roll. I'm a mommy superhero because I plan out my sons' wardrobe for school, pack lunches, help with homework, volunteer in the classroom, and stay in touch with their teachers. I entered your Pampers Cruisers giveaway. I entered your Rubbermaid Spray Mop giveaway. I'm a superhero because I make sure everyone gets where they're going with everything they need. What makes me a superhero during this time of year is being able to push a stroller, hold my two year olds hand, try and feed a baby and make it through the insane crowds in stores undertaking back to school shopping! This time of year, I'm a 4H superhero because of the work I do with our county's 4H ambassadors and the haunted house/carnival fundraiser! Thanks for the giveaway! 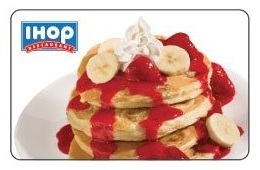 I like Ihop on Facebook! I tweeted and follow you on Twitte from @Polopony95! I liked Thanks, Mail Carrier on Facebook! I am a longtime GFC follower! Work, home, kids and all activities...surviving from all these make me a superhero. What makes me a super(MOM)hero is that I make sure my girls are up and ready for school, I get their lunches packed and breakfast ready. I also make sure (constantly remind them) that their homewaork is done AND put away in backpack and clothes are picked out the night before. ETC. Being able to get everything needed, keep everyone organized and calm anyone down that is upset. My ability to juggle everyones schedule. I am always a superhero because I juggle my kids schedules, taking care of the home and working FT! Work, volunteering, class schedules, shopping, home - actually I manage to juggle all this better if I don't scare myself by listing it all out. I'm a superhero this week because even though my Dad's getting a biopsy today, and my BFF also in the hospital, I'm still managing to do all the work of getting my kids ready for school, which starts Monday. i am a superhero because i try to get everyone needs and a little of everyone wants. I guess I'm a superhero to my kids because I help them with all their school work, volunteer at their schools often, drive them to all their sports and activities and still find time to make their meals, clean their clothes and keep them organized. I'm a superhero because I've been making sure the kids have all their school supplies, clothes and food to pack for lunches for school to start next week! Being able to get everything that's needed.